Week 2 of the National Championship has run its course and it has been a very exciting week. Teams were at loggerheads to secure those precious Championship and Regional points while others battled to claim a spot in the National League. Who made the cut? Who didn’t quite squeeze by? Who hit rock bottom and who reached the sky? Let’s find out. University of Birmingham Storm managed to defeat Aston Aunties in a clash at the top, securing the top spot and maximum Championship points despite their reputation for second best. The Memers from Cambridge held off the challenge from the Manchester Bunnies to claim 3rd. Leeds A slipped up against the USW Dragoons this week but remain in the top eight on points. However, they have been pipped by strong performances from Grey Warwick, the Sussex Offenders and Droolio’s motley crew. It was a bad day for National League teams in the Promotion Tournament as only three of the eight teams from the top tier managed to avoid relegation. However, one team’s loss is another team’s gain. Congratulations to these teams for making it to the National League! With all of the North’s teams finding success in the Promotion Tournament, whether that be reaching the Garden of Eden or avoiding relegation, this league saw no new additions. PJ Saltford came up trumps against the Abertay Aardvarks to make themselves this week’s King of the North as well as claiming the top of the table. The Aardvarks are in second closely followed by BECKETT and UoE Blaze. GSoC Nerds from the University of Stirling make up the top five. This was not a good week for the Midlands in the Promotion Tournament as UoB Tempest dropped out of the National League. Meanwhile, the Unicorns of Leicester, Death by SHU SHU and Shefeeders failed to scrape through meaning it’s another two weeks before they can have another crack. With Lincoln’s Last Knights defeating Staff’s Last Resort in the week’s Regional Final, they share top spot. Staff’s must be content with 6th. Hoes Appreciation Team dropped out of the National League while Typical Five and Bristol A Team also failed to make it through the Promotion Tournament. Team Solent Mid were able to see off Aberystwyth University to become this week’s champions of the South-West and Wales while the tastefully named GangBangors beat Genrully Better from the University of Portsmouth. They join Aberystwyth in 5th. Green Tea and Cambridge Tripos Fighter lost their places in the National League this week while Hobos with GoPros and Better Read than Dead didn’t make the cut. The Imperial Penguins had the chance to join the fallen at the top of the standings but fell in the Regional Final to CT Blaze, the team from City University staking their claim after a week’s absence. KU CSGO > LOL also fell to CT Blaze along the way, but remain in 6th. CT Blaze are this week’s regional champions. Our featured match saw a classic matchup from the Midlands as the Aston Aunties faced off UoB Storm in the National League Finals of Week 2. The University of Birmingham team were determined to end their “forever second” curse, a curse dating back to the Summer Tournament of 2014, the Grand Final of last season’s National Championship and every single split leading up to it. So often they had been defeated by their rivals the Cambridge Memers, another top team currently in the midst of roster changes. 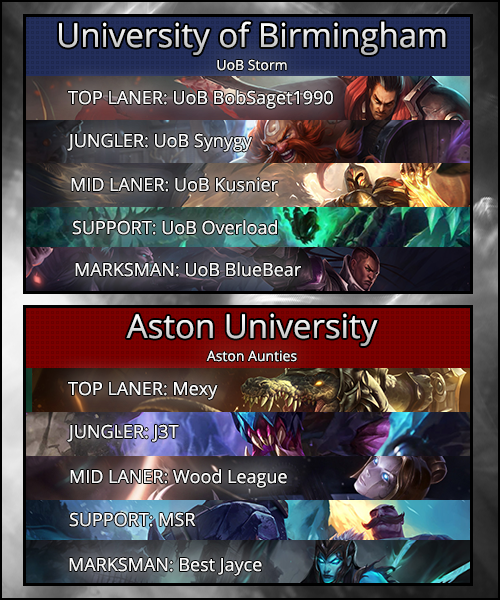 However, UoB Storm boasted new toplaner BobSaget1990 with old jungler Synygy back amongst the action and former toplaner Kusnier role-swapping to the midlane. With Kusnier so key to Storm’s success last year on champions such as Singed and Mundo, it was to be seen whether he could transfer his dominance across the Rift. Opposite them the Aston Aunties were their stumbling block, a bold speed bump on the road to redemption and riding a rich vein of form themselves. Could this new roster put the meme to rest? We jump into the action, UoB Storm one game up in the series.. The game started off pretty evenly for the two teams as they shared kills three to three. However, UoB had a small advantage with one tower to their name. A fight around dragon saw Synygy’s Gragas steal the reptile’s rewards with a sneaky steal. However, fat men don’t make the best ninjas as he fell in the process. BlueBear on Lucian mispositioned and paid the price leaving Overload’s Thresh vulnerable. The fight ironed out the gold lead that Birmingham had amassed, though a dragon now separated the two teams. UoB Storm were able to pick up a few kills before the next fight, the score being eight to eight, re-establishing their lead. Yet again it was around the dragon that a fight broke out, Wood League’s Orianna landing a Command: Shockwave on four players. However, AoE damage from BobSaget1990’s Darius and Kusnier’s Kayle turned the fight and devastated the Aunties. This resulted in a four for two swing to UoB Storm as well as a dragon. From there the Aston Aunties were always on the backfoot. They weathered the storm for another twenty-eight minutes, but with two inhibitors down they were left with no choice but to fight. However, the huge frontline of Darius and Gragas were too much for them to push through. Lucian and Kayle rained damage down from the back leaving only Braum alive to hold the fort. It was all over and UoB Storm were victorious. Somewhere a meme cried out in pain as it lost its grip on reality and faded into darkness. There were a couple of contenders for MVP. Kusnier deserves an honorable mention for his mega-farmed Kayle (536 cs) as well as some huge teamfight presence. However, this week’s MVP award for our featured match goes to BobSaget1990. He won his lane convincingly and was a wrecking ball in teamfights, making mincemeat of carries and tanks alike. Only dying once, this was one tough raidboss. Congratulations! Join us this Sunday for some more NUEL action at 6:45pm. Will the Aston Aunties come back? Will UoB Storm fall back into their runners-up ways? Will there be a new challenger? See you on Sunday!